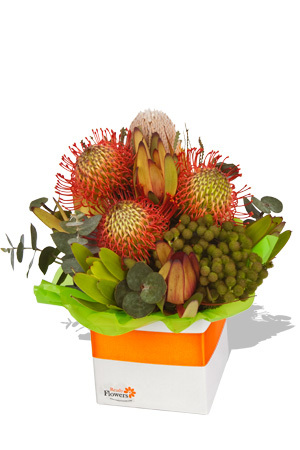 The rich rustic colours of this creative and solid arrangement with rural overtones, will appeal to anyone who loves the variety of Australian nature. The mere sight of this affluent arrangement enriches one’s senses and the coin shaped leaves gives associations to money and are known to bring good luck, which can only be regarded as an added bonus. Give Miss Money Penny to someone you wish to enrich today.You can send a super double surprise by adding a Premium box of chocolates to your flower arrangement. I only went on line 10 minutes before last time for same day delivery and it was delivered that afternoon. Recipient was very happy. Great website and great shopping experience - thank you for delivering the flowers so promptly and efficiently and for emailing me and keeping me updated on the delivery status. Excellent service.